Vintage assorted silver plate serving trays. 15" round. Polished or Shabby Chic. Assorted vintage small decorative silver plated trays. Ranging from 6"-8"
Vintage three tiered silver plated serving tray with a round handle and a pedestal base. 27" high x 12" bottom, 10" middle, 7" top. Assorted vintage silver plated serving trays. 12.5" round. Polished or Shabby Chic. Vintage silver plate round footed serving tray with decorated edge. 11" round. Large Silver Oval Tray with Handles. Vintage silver plated oval tray with handles. Decorative embossed pattern. Three tiered polished silver stainless steel serving tray. Perfect addition to your appetizer or dessert bar. 29" tall x 12" bottom, 10" middle, 8" top. Silver Two Tiered Tray Fancy. Vintage silver plated two tiered serving tray with lattice edges and a round handle. 10" tall x 7" bottom, 5.5" top. Cute as a button! Assorted vintage silver plate serving trays. 10" round. Polished or Shabby Chic. Assorted vintage oval silver plated trays. Various sizes. Polished or Shabby Chic. Three tiered fancy silver plated serving tray on decorative pedestal with embossed Boho handle at the top. 21" tall. 11.5", 11.5", and 8" trays. 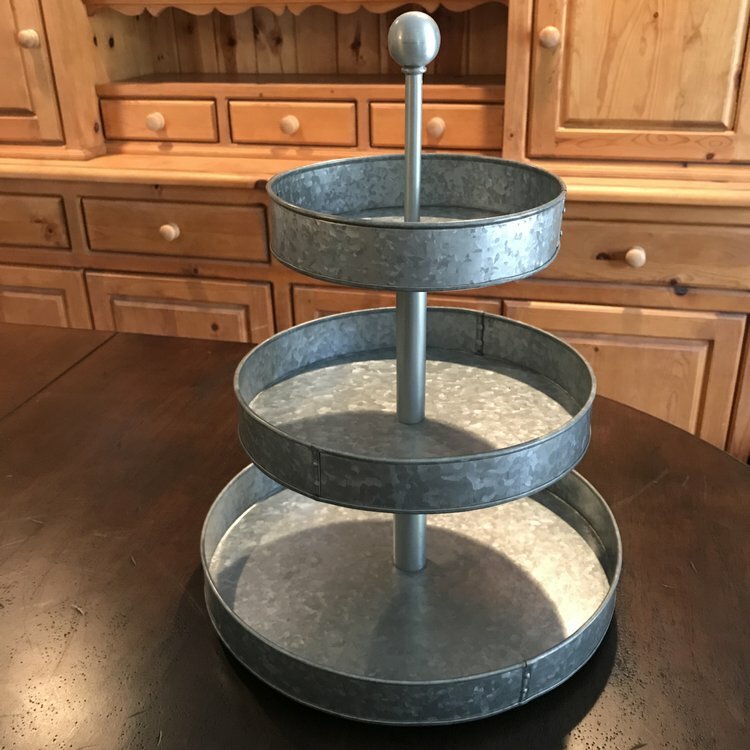 Three tiered round galvanized serving tray on a small pedestal. Perfect addition to your dessert bar, or appetizer table. 20" tall. Trays are 15", 12", and 9".